The "Green" in greensand casting refers to the moisture content of the sand, rather than the color or type of sand. Just as untreated, undried wood is often referred to as "green," so is the moist sand used for greensand casting. 1) Pattern: Just like other sand casting methods, the process begins with a carefully designed and rendered pattern matching the final product, but with allowances for shrinkage, gating systems and draft. Nearly any material can be used for the pattern since no heat or stringent chemicals will be applied. Common materials are plastics and wood. 2) Compaction: Once the pattern is ready, a flask is placed around the pattern to hold sand for compaction around it. In most cases, the mold will consist of two halves: cope and drag. Depending on the specific casting method, the cope and drag may be separate patterns or both cope and drag patterns may be placed on opposite sides of a match plate. Either way, sand will be compacted around the pattern until the mold is sufficiently durable to accept pouring. 3) Pouring: The cope is placed on top of the drag, and molten metal is poured into the gating system. 4) Shakeout: After the casting has been allowed to solidify, the sand is shaken out and removed from the casting. The gating system can then be removed, the casting can be finished, and the sand can be reclaimed and conditioned. 5) Sand reclamation: Immediately following shakeout, sand used in the mold is processed by a muller, or a system for sifting and conditioning the sand. Muller systems vary in sophistication, but most are capable of providing operators with feedback on the moisture levels and general consistency of the sand. Based on that data, raw sand, water, clay and other inputs can be added to improve the compactability of the sand. A lot goes into conditioning sand for greensand casting. Experienced operators can tell whether greensand is optimized by simply feeling the consistency, or by observing the sand's ability to compact around the pattern. Other methods for testing the sand can be employed, such as a methylene blue test indicating clay levels. Since greensand casting operations vary from foundry to foundry and even from job to job, it's important for a greensand casting foundry to perform tests on their sand in order to establish an optimal baseline. They can then add ingredients to reclaimed sand in order to return it to that baseline and ensure consistent castings. At Eagle Aluminum Cast Products, we often use greensand casting to produce large, thin-walled castings of aluminum parts. With slight variations in equipment and process, we could produce nearly anything through greensand. During the product development phase, we work with our customers to determine the optimal process to use, resulting in the highest quality products at the lowest per-part cost. Greensand casting can either be conducted manually, with operators performing the jobs of compaction, pouring or shakeout, or using an automated system. With manual greensand casting, setup costs are often lower than other casting methods. Tooling can be made from plastic or wood, rather than iron or steel, and the mold itself is made from easily reclaimed material. However, with manual greensand casting, per-part costs can be high because of the number of operators required to produce each casting. Automated greensand systems, on the other hand, can produce high volumes at lower per-part cost, more comparable in that regard to processes like permanent mold casting. However, drawbacks to automated greensand casting include high startup costs for the foundry and the need to more precisely control the makeup of the sand. Another benefit of greensand casting is its flexibility in allowing a wide range of alloys to be poured. 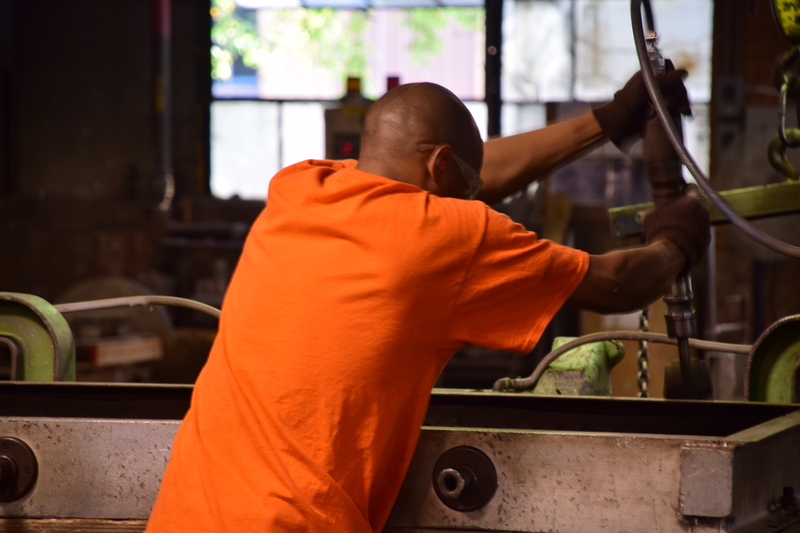 At Eagle Aluminum we use two aluminum alloys in our castings, but the greensand casting process can work with nearly any ferrous or non-ferrous alloy. Written by Jim Smith, Jr.